This is a sponsored post written by me on behalf of Farmland. 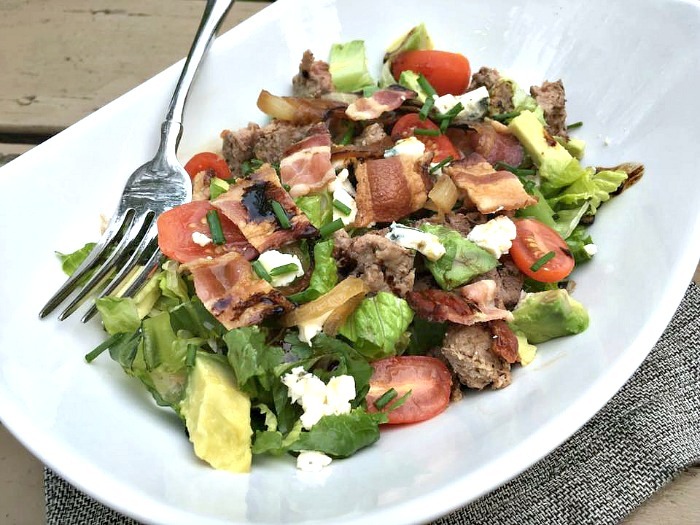 This Farmland Applewood Smoked Bacon-Bleu Burger Salad has all of the amazing flavors of your favorite burger on a bed of crunchy greens. The smoky bacon and the creamy bleu cheese pair perfectly with the sweet onions. So actually, this happened. 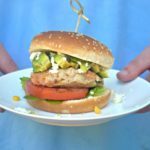 Let me explain to you why I decided to build my favorite burger recipe on top of a salad. You see, when I go out to restaurants I always have a dilemma. Should I get a big flavorful burger with my favorite toppings? Or should I be good, and get a salad? Instead of choosing, I decided to have the best of both worlds! 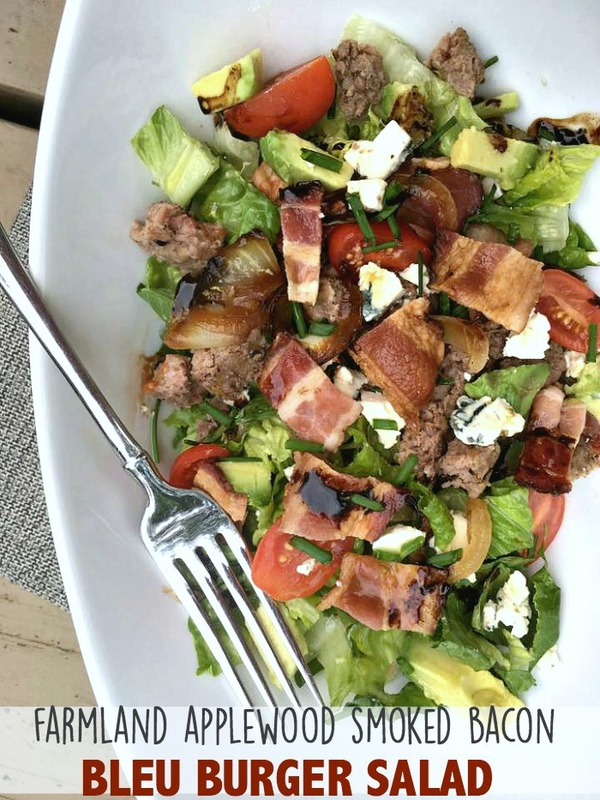 Take my favorite toppings from my favorite burger, for me – those toppings include bacon, bleu cheese and caramelized onions – and build them on top of a salad. It’s a win, win! And of course, I can’t use just any bacon on my perfect ” burger salad”. I have to use the smokiest, most flavorful bacon. That brings me to this. Farmland Applewood Smoked Bacon. This bacon adds perfect flavor to any dish. A little of this bacon adds a big punch of flavor. Of course, you can always add extra bacon too! Since I moved to Iowa in my early adulthood, I have really learned to appreciate bacon! It is so flavorful, crisp and wonderful. Here in Cedar Falls, I find Farmland products at Hy-Vee or Fareway. How do you like to cook your bacon? I prefer to make mine in the oven. I love it when it achieves that perfect amount of crisp. Farmland Applewood Smoked Bacon is the perfect blend of sweet and smoky. 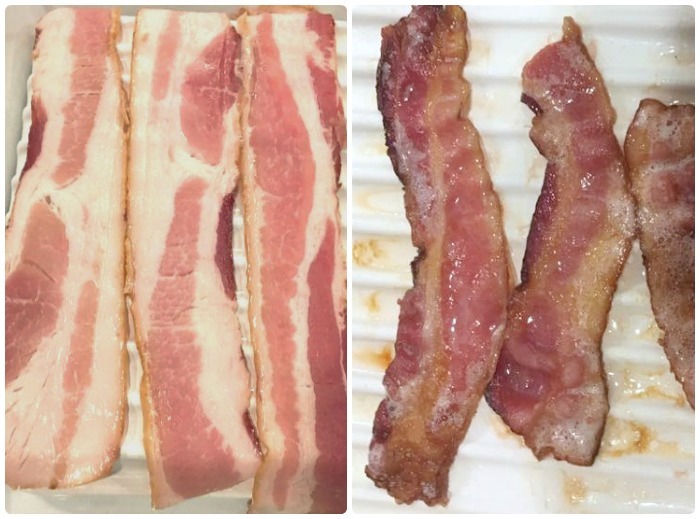 It is actually hand-trimmed and slow smoked over real Applewood chips for maximum flavor and was previously named the #1 Highly Recommended Bacon by Cook’s Illustrated. Farmland’s dedication and passion, in working with Midwest communities and Midwest farmers all play a role in bringing their delicious products from farms to your kitchen table. 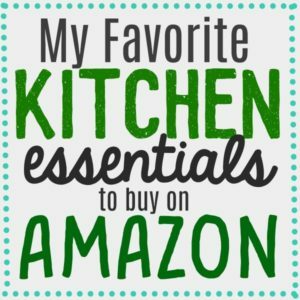 Some of Farmland’s other products that you should try include: bacon, sausage, ham and more. 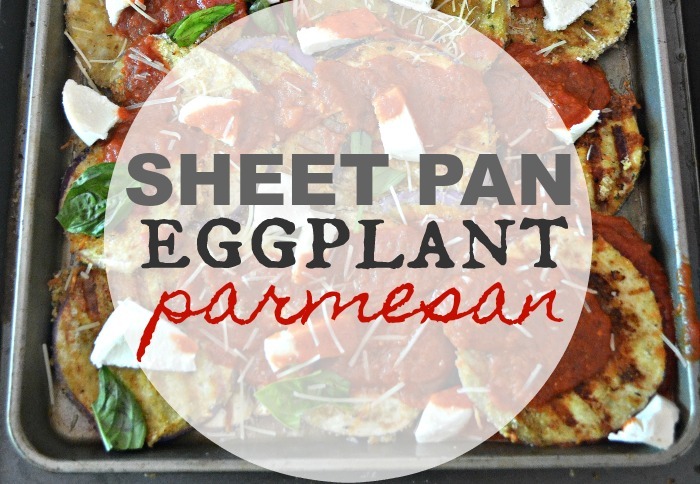 Head over to FarmlandFoods.com for more “farm-to-table” recipe inspiration! Method Prepare ingredients. 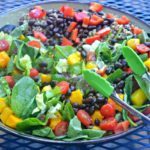 Wash, dry and chop romaine lettuce and arrange in a large salad bowl, or in individual salad bowls. Cook beef patty on the grill or on stovetop. Cook Farmland Applewood Smoked Bacon according to the instructions on the package. Caramelize onion in olive oil. Cut avocado into small pieces. Cut baby tomatoes in 1/2 and chop scallion. Prepare Maple-Balsamic salad dressing. On top of the lettuce, arrange the other salad toppings to your liking. Add Bacon, chopped hamburger, avocado, bleu cheese, tomatoes, caramelized onions and scallions. 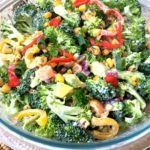 Drizzle with salad dressing before eating. Method: In a measuring cup or bowl, add all the ingredients and whisk for 10-20 seconds. This salad was seriously amazing. 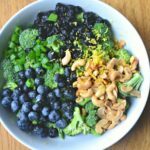 I love eating delicious food, while getting in my daily greens. This salad was filling, but didn’t weigh me down for the rest of the day either. I didn’t miss the burger bun at all. 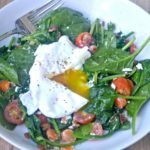 The Farmland Applewood Smoked Bacon made this salad totally satisfying and wonderful. I actually made this salad, while visiting my parents. I cannot wait to make this for my husband. He is constantly ordering bacon-bleu burgers at restaurants. Don’t forget to check out Farmland’s website and check them out on social media as well! Right now, Farmland is giving away a year’s worth of free bacon! 8 winners have a chance to win a year’s worth of FREE Farmland Bacon and ONE winner will receive a $200 Amazon Gift Card + a year’s worth of FREE Farmland Bacon. Check out this amazing contest below! You really dressed up this salad. Love the combination os romaine, caramelized onion and balsamic. I have to make this. I’ve never heard of a burger salad – Love it. I have to try this…. I like the balsamic dressing on my salad and this one made me crave for more. you had me at bacon! 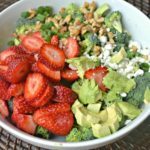 so many amazing flavours in this salad and so filling! That look so tasty, bacon like butter makes everything better, love the dressing too!